The Oakland Raiders were riding a 14-game regular season winning streak, one short of the American Football League record, as they hosted the San Diego Chargers on October 13, 1968. Head Coach John Rauch’s team had won the AFL Championship in ’67 (and lost the second Super Bowl to Green Bay) and was 4-0 thus far in 1968. The offense was guided by “The Mad Bomber”, QB Daryle Lamonica, and deep-threat split end Warren Wells had moved into the starting lineup to pair with steady flanker Fred Biletnikoff. The defense was missing some injured veterans, most notably DT Tom Keating, but had picked up talented rookies in LB Chip Oliver and George Atkinson, a prospective cornerback who could return kicks well. The Chargers, coached for the ninth year by Sid Gillman, were also off to a good start at 3-1, having lost to the Jets the previous week. 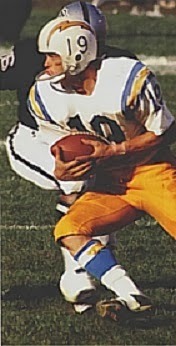 They had a potent offense guided by QB John Hadl that moved well both in the air – especially when throwing to star flanker Lance Alworth (pictured above) – and on the ground behind an excellent line. The defense was young and less impressive, but had performed well thus far. There were 53,257 fans in attendance at the Oakland-Alameda County Coliseum with a light rain falling. The Chargers got the first break when FB Hewritt Dixon fumbled after catching a pass from Daryle Lamonica and DT Scott Appleton recovered at the Oakland 35. 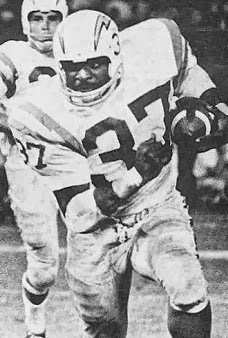 John Hadl completed a pass to TE Jacque MacKinnon for 15 yards but, after reaching the 17 yard line, two passes were incomplete including a throw into the end zone that was broken up by FS Dave Grayson and San Diego came away with a 24-yard Dennis Partee field goal. On the ensuing kickoff, George Atkinson fumbled on the return and the Chargers again recovered, this time taking possession at the Oakland 34. After picking up ten yards, Hadl was intercepted by SS Rodger Bird, but San Diego got the ball back four plays later – and after Lamonica had connected with WR Bill Miller for 36 yards – when FS Joe Beauchamp picked off a pass at his three yard line and returned it 22 yards. The Chargers went three-and-out on the ensuing series but once again Atkinson fumbled the ball away, this time on the punt return, and San Diego had new life at the Oakland 31. Hadl immediately threw down the center of the field to Lance Alworth for 20 yards and FB Gene Foster followed up with a nine-yard run to the two yard line. Three plays later, Foster dove into the end zone from a yard out and, with Partee’s successful conversion, the visitors were ahead by 10-0. The Raiders moved the ball effectively on their next series – and more importantly, didn’t turn it over. But the drive stalled at the San Diego 46 and they were forced to punt. As the game moved into the second quarter, the Chargers had to punt the ball back and Atkinson (pictured at left), who had twice fumbled the ball away, gathered in Partee’s 60-yard kick and returned it 82 yards for a touchdown to gain some level of redemption. George Blanda added the PAT and, in sudden fashion, the Raiders were again only three points down. The teams traded punts until the Chargers, getting the ball in good field position, scored in two plays as Hadl connected with Alworth for a 38-yard touchdown. Partee’s extra point made it a ten-point contest once more. With just over two minutes remaining in the half, the Raiders came back with a big play of their own as Lamonica threw to Fred Biletnikoff, who made a one-handed catch on the way to a 58-yard gain to the San Diego 22. But two plays later, SS Ken Graham intercepted a Lamonica pass at his five and ran it back 42 yards. The Chargers were unable to capitalize when Partee’s 39-yard field goal attempt missed to the left. Now with a minute to work with, “The Mad Bomber” again passed the Raiders down the field. Lamonica hit on four straight passes, the longest to Dixon for 17 yards, to get to the San Diego 28 and then, after another throw was broken up, he connected with HB Pete Banaszak for 21 yards and a first down at the seven. Two plays later, Lamonica tossed a scoring pass to Warren Wells from that distance and, with Blanda’s extra point, the score was 17-14 going into halftime. The Chargers started off the third quarter by driving to the Oakland 40 with Foster taking off on carries of 16 and 10 yards, but Partee was short on a 47-yard field goal try. The Raiders went three-and-out and this time, following the punt, San Diego put together a 9-play, 65-yard series. Hadl was nearly picked off on his first pass but then hit Alworth for 25 yards. The drive stalled at the Oakland 20 and this time Partee was successful with a 27-yard field goal that made it a six-point game. Following another punt by the Raiders, the Chargers were driving as the period ended, with the big play a Hadl pass to Alworth for 33 yards. They kept the ball on the ground and ended up with another Partee field goal, once more from 27 yards. San Diego’s lead was up to nine points. Once again the Raiders had to punt and the Chargers moved the ball well on the ground, with Foster and HB Russ Smith leading the charge. They ultimately had to punt, but from the Oakland 45 and Partee pinned the Raiders down at their 10. Lamonica threw two incomplete passes and was sacked once, and the ensuing punt gave San Diego the ball at midfield as the Chargers were winning the battle for field position and utterly shutting down Oakland’s offense in the second half. The Raiders were never able to get out of their side of the field again and San Diego held on for a 23-14 upset victory. The Chargers outgained Oakland (384 to 260), with 170 yards of that total coming on the ground, and also lead in first downs (20 to 11). The Raiders turned the ball over five times, to one suffered by San Diego. John Hadl completed 14 of 32 passes for 220 yards and a touchdown with one interception. Lance Alworth had a big performance as he accounted for 9 of those completions for 182 yards and a score. Gene Foster (pictured at right) led the productive ground game by rushing for 104 yards on 27 carries that included a TD. 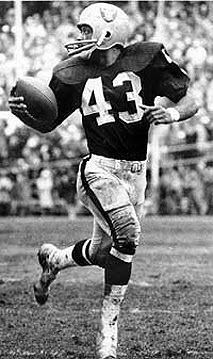 For the Raiders, Daryle Lamonica was successful on 13 of 32 throws (with only three of those completions coming in the second half) for 229 yards with a TD and two interceptions. Hewritt Dixon led the club with just 21 rushing yards on 10 carries and also caught 5 passes for 44 yards. Fred Biletnikoff topped the club in pass receiving yards with 58 on his lone reception. Bill Miller contributed 44 yards on two catches. The Raiders lost again the next week at Kansas City, but recovered to win all of their remaining games to finish at 12-2. That wasn’t enough to win the Western Division outright as the Chiefs matched that record, but Oakland convincingly defeated them in the playoff before losing the AFL Championship game to the Jets. San Diego, meanwhile, was in the hunt until losing three of four games (the last was to the Raiders at home) to finish out the season at 9-5, placing third in the division. Lance Alworth had another big year, leading the AFL in pass receptions (68) and yards (1312) to garner consensus first-team All-league honors for the sixth straight season. John Hadl was an AFL All-Star as he passed for a league-leading 3473 yards and 27 touchdowns, but also led the circuit with 32 interceptions. While Daryle Lamonica was criticized for not matching his MVP success of the previous year, he still threw for 3245 yards and 25 TDs, ranking second only to Hadl in those categories, with 15 interceptions. George Atkinson had an overall fine season returning kicks, topping the AFL in combined returns (68) and yards (1292) as well as kickoff return average (25.1) while ranking second in punt return average (13.6). He also saw more play in the defensive backfield as the season progressed and would become a stalwart at strong safety over the course of ten years.